Last edited by CrAzY dRiVeR : 20th March 2019 at 15:26. 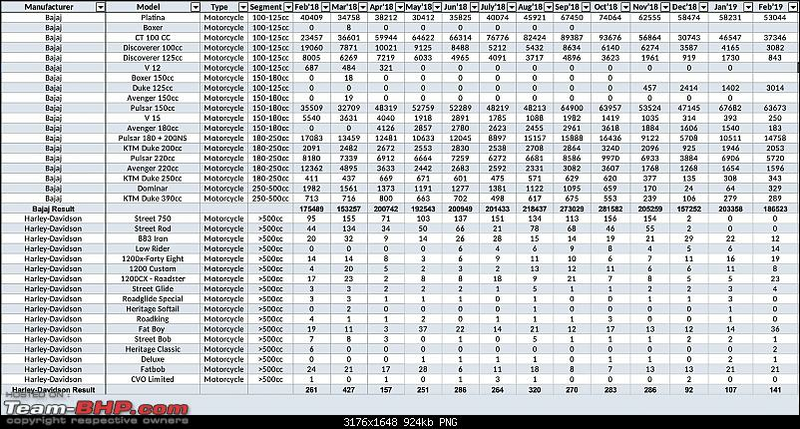 Moving thread from Assembly Line to Motorbikes forum. Thanks for sharing, Sujai ! 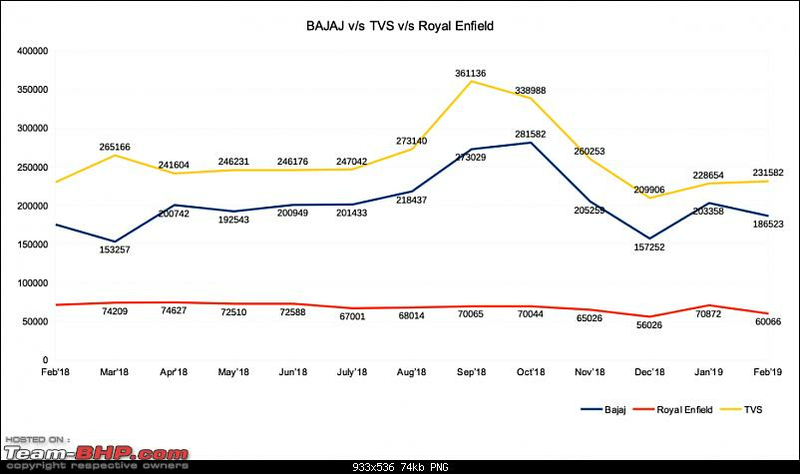 Rahul Bajaj expects some manufacturers to cut production by up to 50% in March, thanks to huge inventory build up at dealerships. 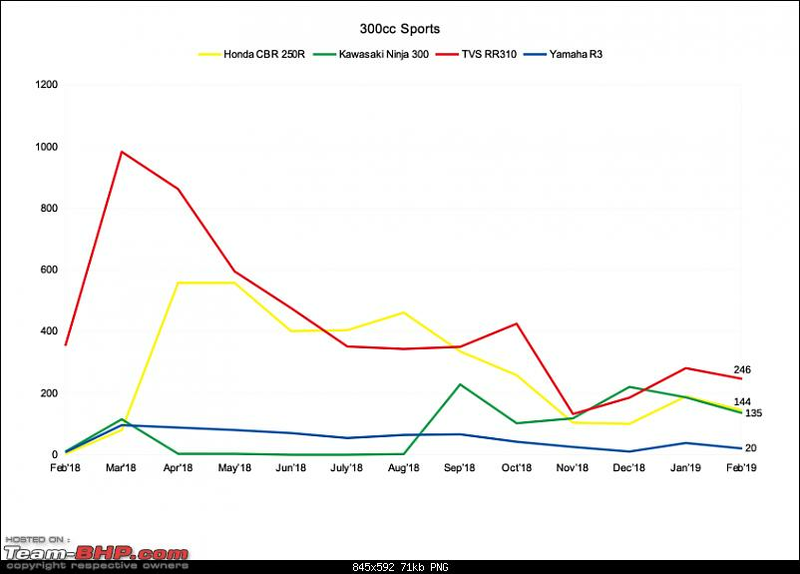 RE really needs to do something to improve the value proposition of their 500cc bikes. 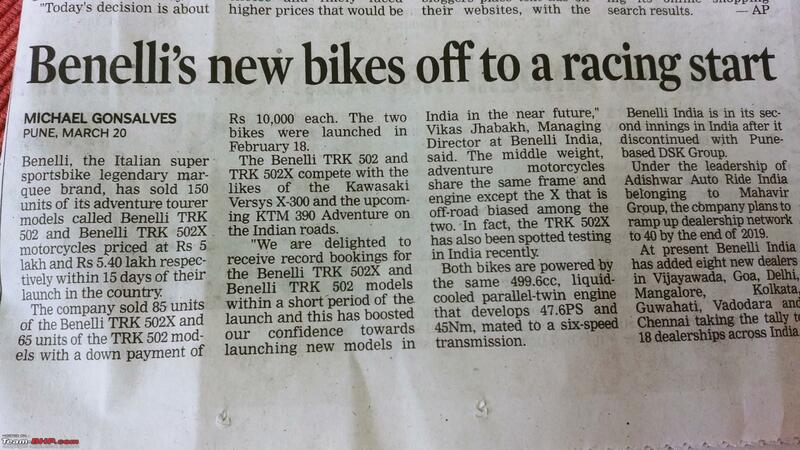 Most are close to 2.5 lakhs on road and just 50k more will buy the far far superior twins. Riding them one after another, it is hard to believe the same manufacturer makes both these bikes. 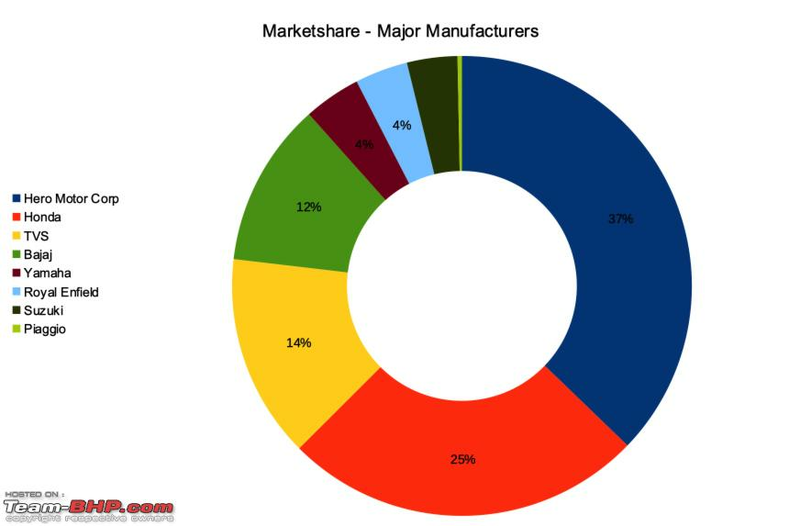 Gaining marketshare amidst falling overall sales numbers in the market. 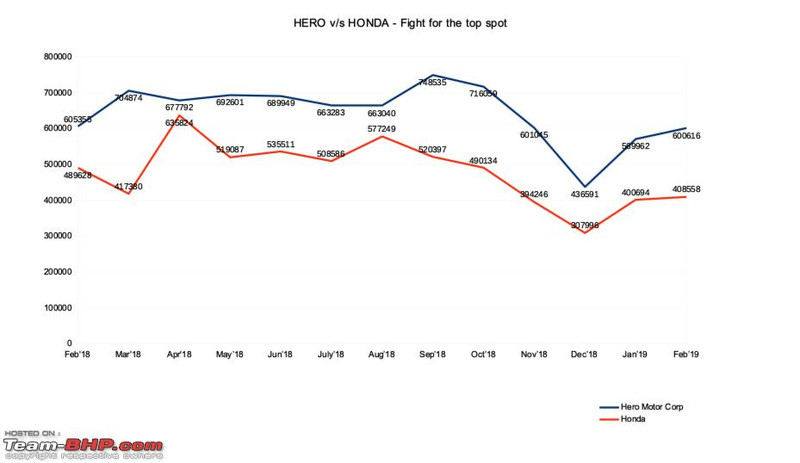 YoY numbers show only negligible fall and I guess Hero will be happy with it. 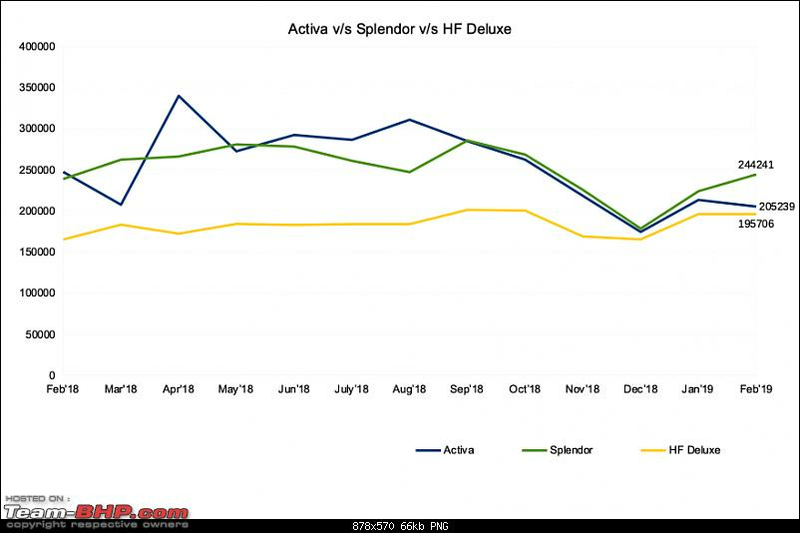 HF Deluxe is closing in on the Activa for the 2nd spot as well - with sales improving over 11.6% YoY. 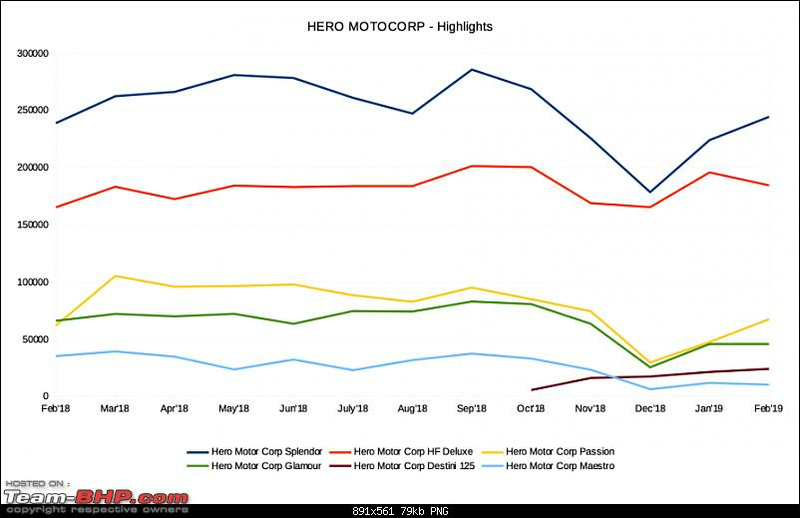 The newly launched Destini 125 is off to a great start, but unfortunately seems to have come at the cost of Hero Maestro. 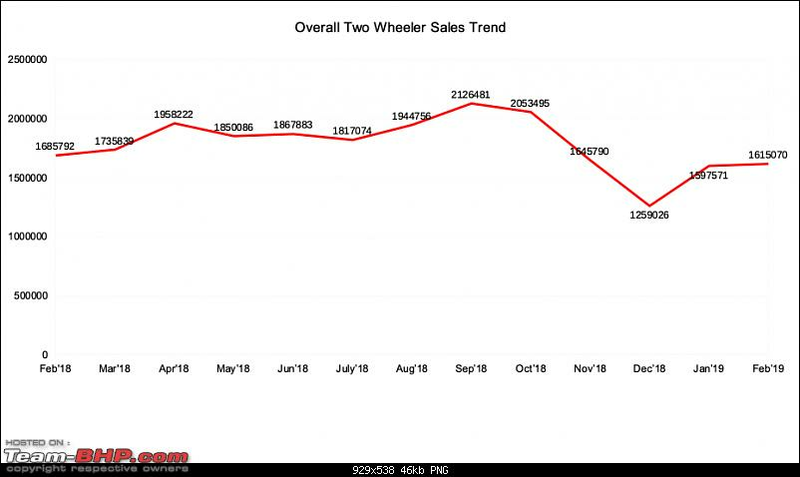 Over 16.5% fall in sales YoY. 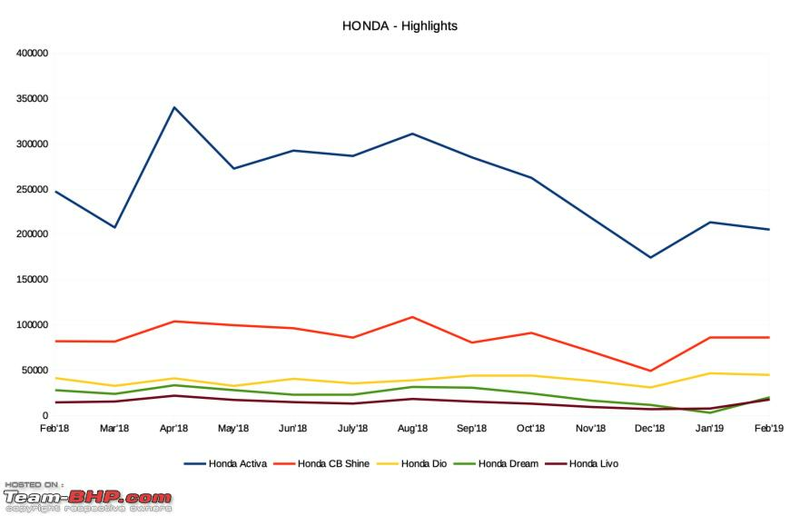 I doubt if the Honda camp will be happy. 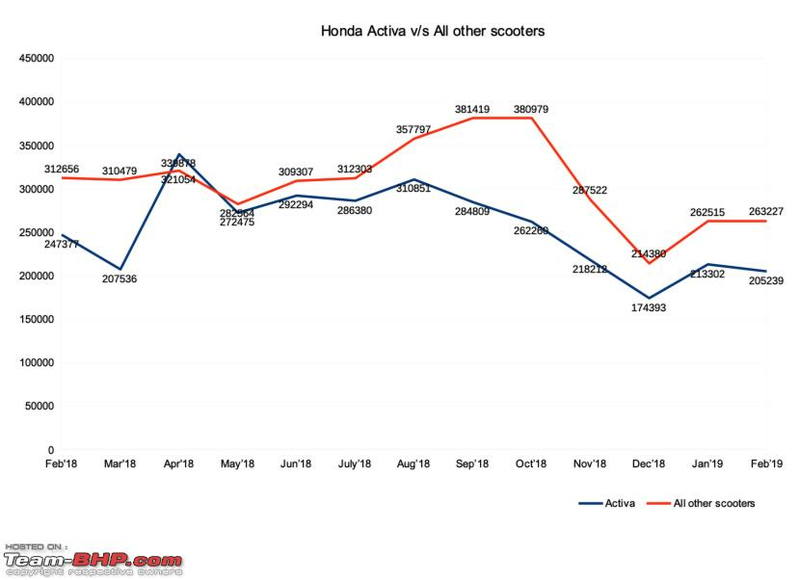 Activa sales have seen a decline, with 3.78% YoY. 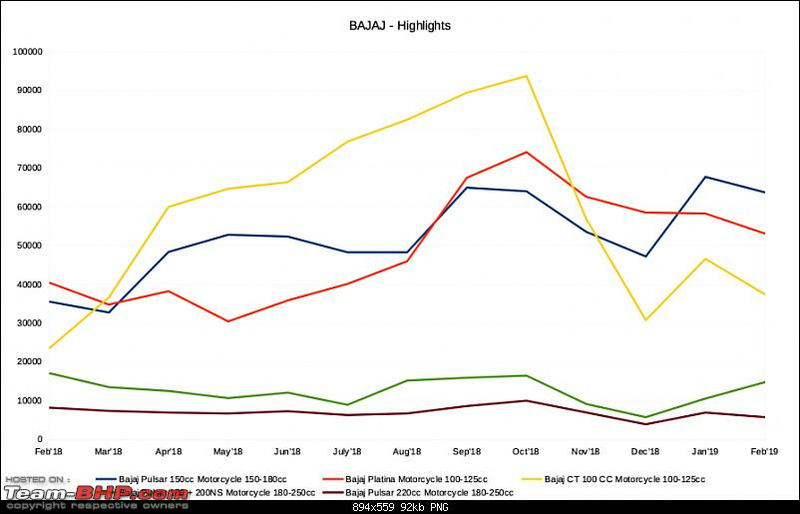 Company is heavily dependant on Activa sales, although CB Shine and Dio provides steady numbers for the brand. 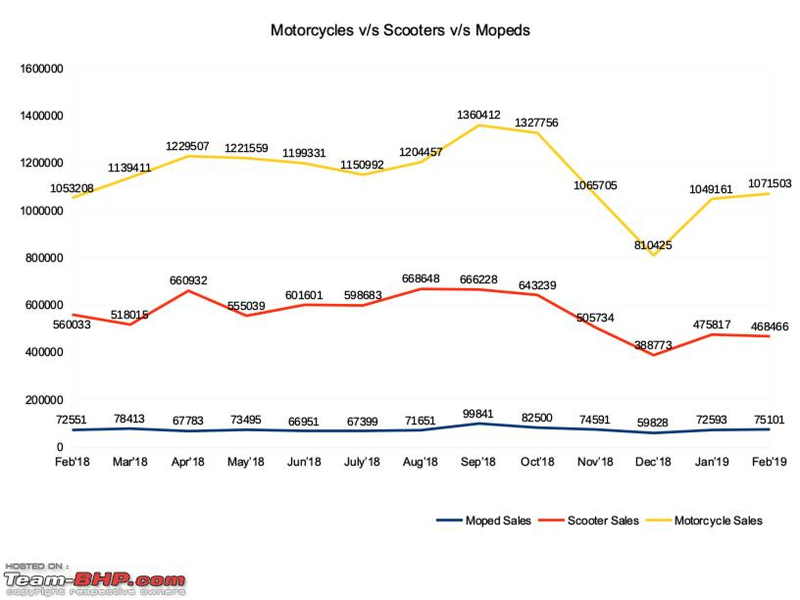 Scooter sales fell YoY whereas motorcycles and mopeds were steady. This wont be encouraging for the company. Has the 125cc Duke gamble paid off? 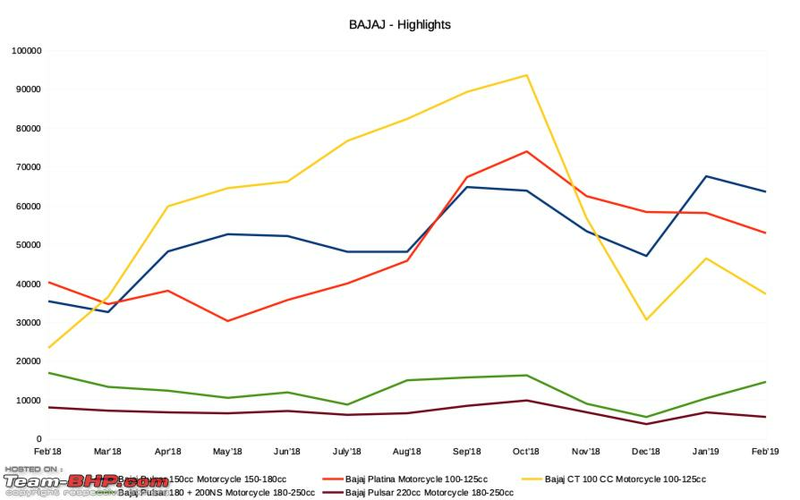 Overall a decent YoY performance of 6.29% for Bajaj, but they might be sitting on a lot of dealer inventory as Smartcat pointed out above. MoM has declined by 8.28%. 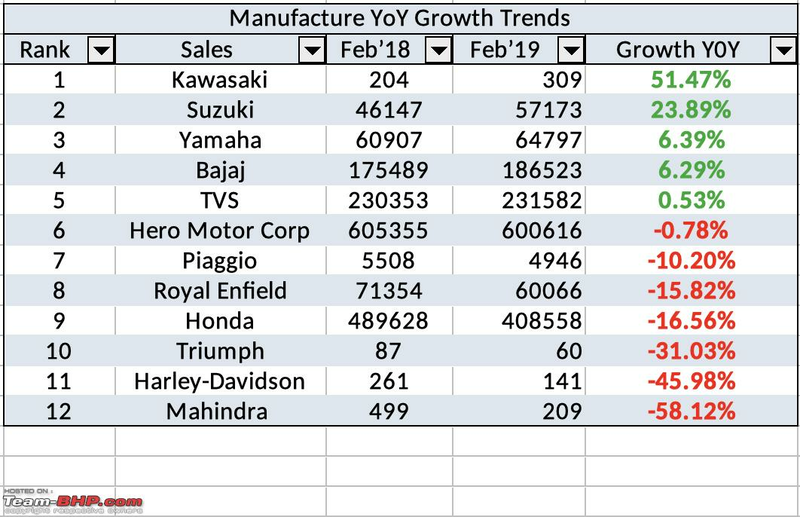 Old brands like Pulsar, Platina and CT100 still provide decent growth. 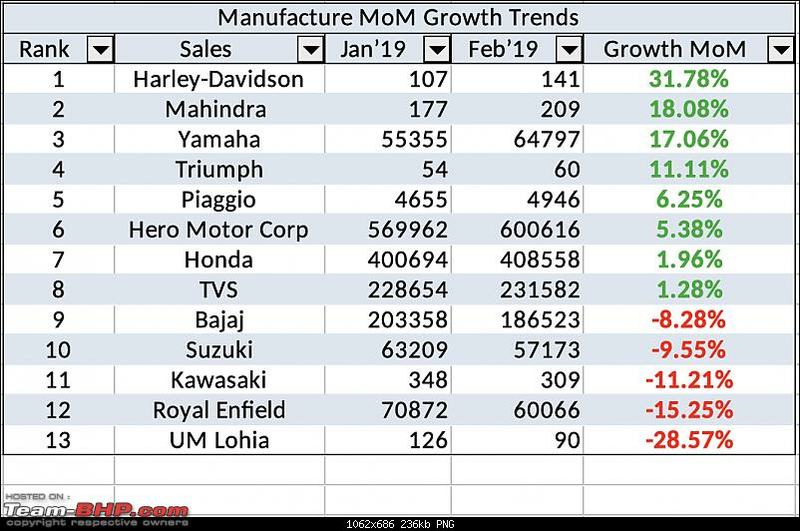 Maintains steady numbers YoY with small MoM growth. 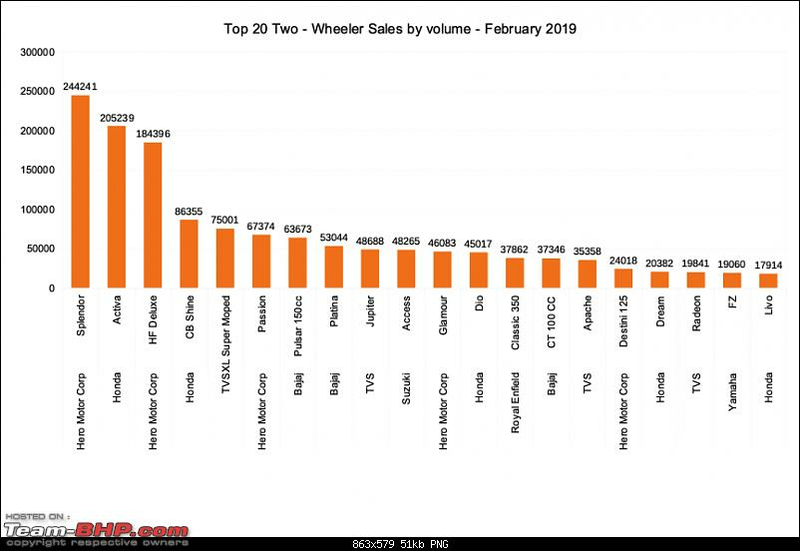 Will be worried about Jupiter which has lost more than 50% sales steadily since October 2018. 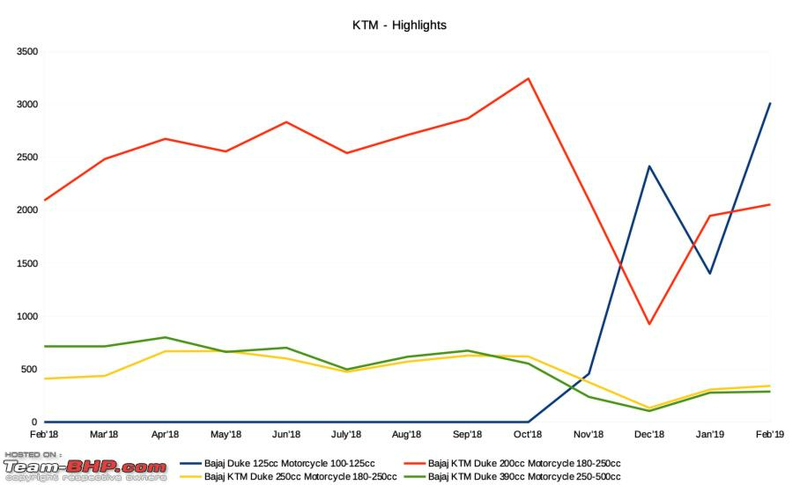 XL Super moped still does 75k units a month, consistently! 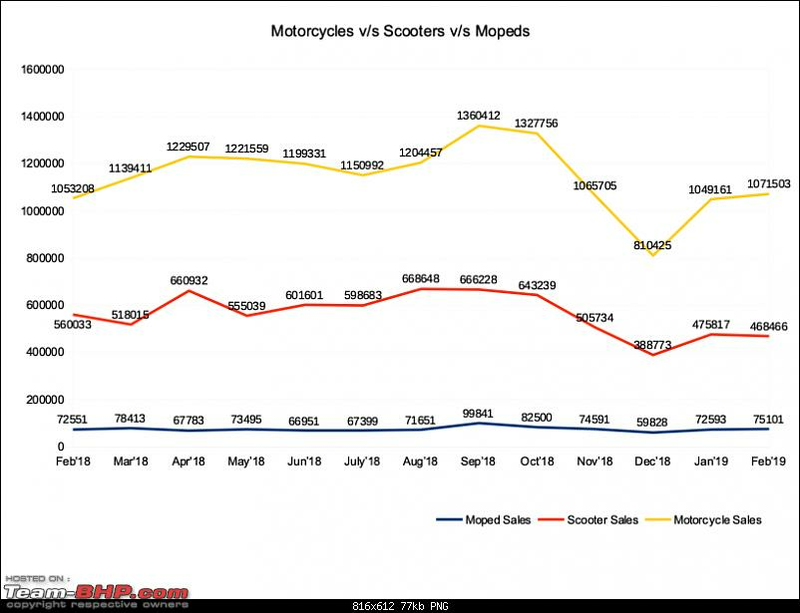 Apache still provides steady numbers, whereas NTorq has also established itself in the 125cc segment. 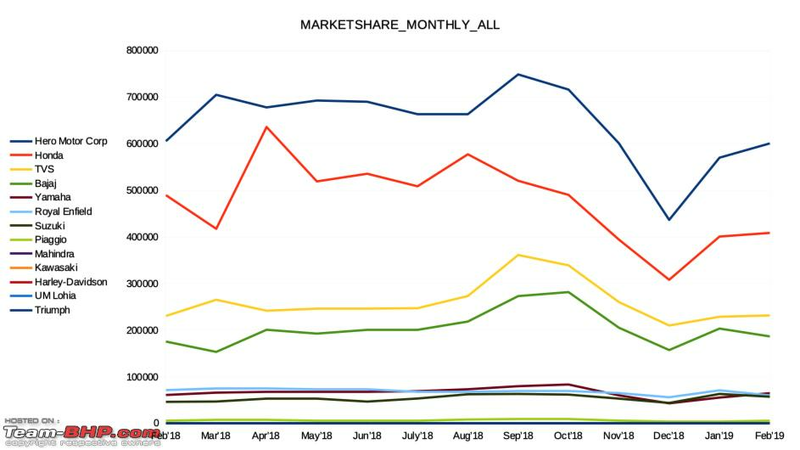 Loss of more than 15% sales MoM and YoY, despite a blockbuster launch last year. RE camp will not be happy. 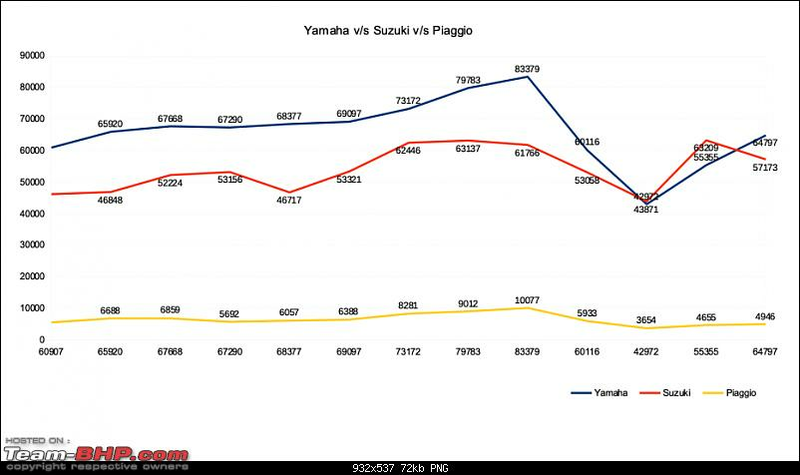 Their bread and butter model, the Classic 350 sales have seen a steady decline of over 22% YoY, even as Bullet 350 remains steady. 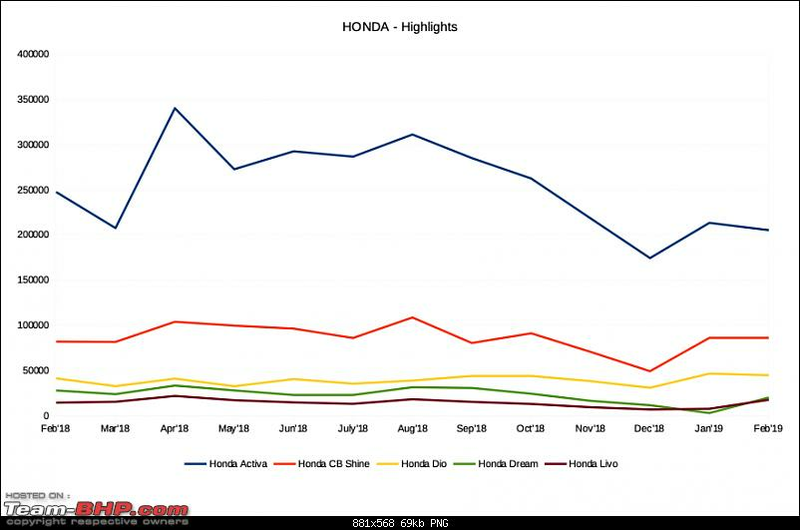 650 twins off to a good start, with no signs of slowing down - however, it has come at an even bigger loss in sales of the Classic 500. 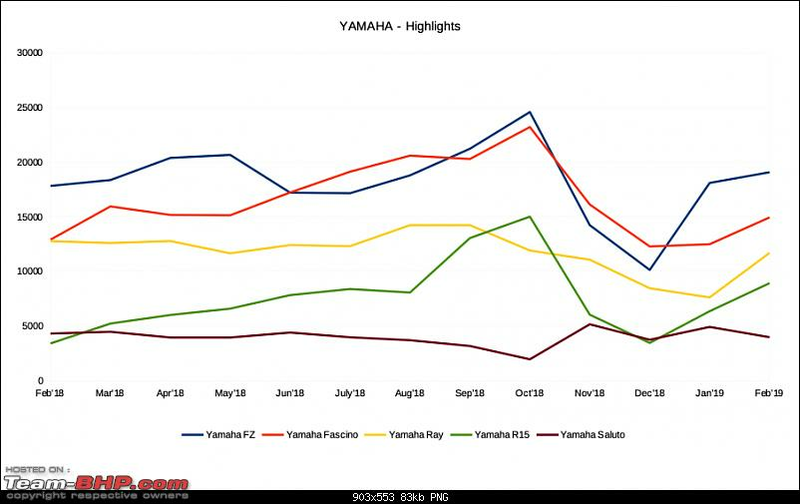 Balanced portfolio with FZ, Fascino, R15, Ray all being average performers. However, turning into a one trick pony with Access alone bringing in numbers, Burgman Street a very distant second. 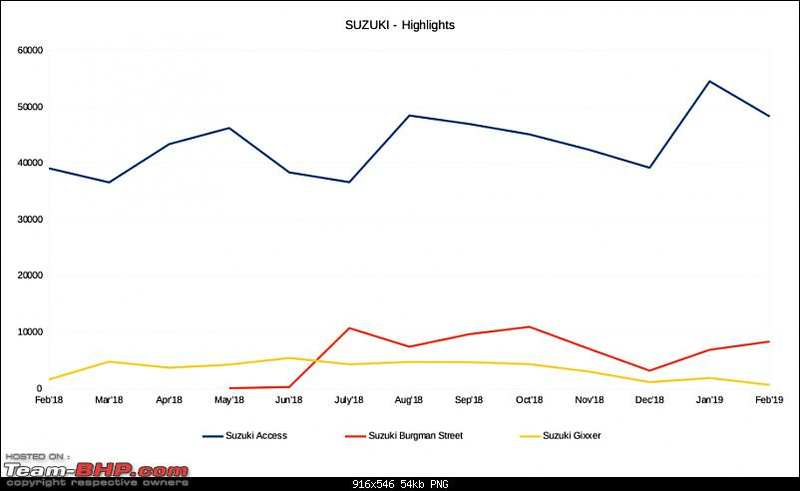 Hayabusa is the 4th selling model in the Suzuki lineup. Tiny number of dealer dispatches continue. 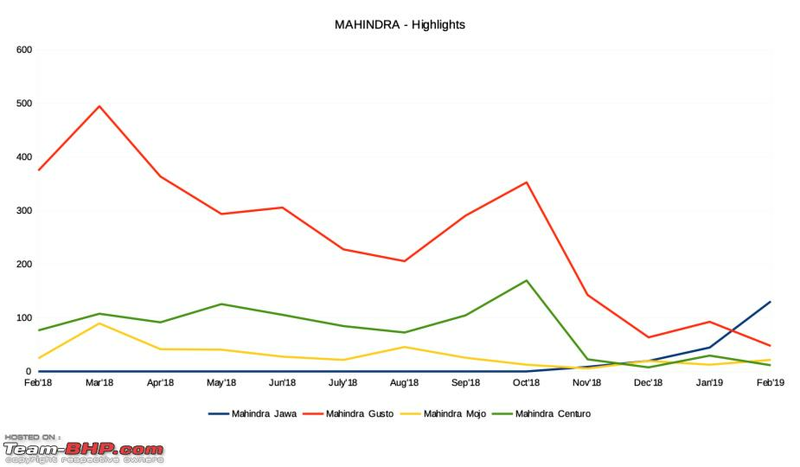 With customer deliveries set to begin by end of march, we should be seeing better action from the next report onwards. 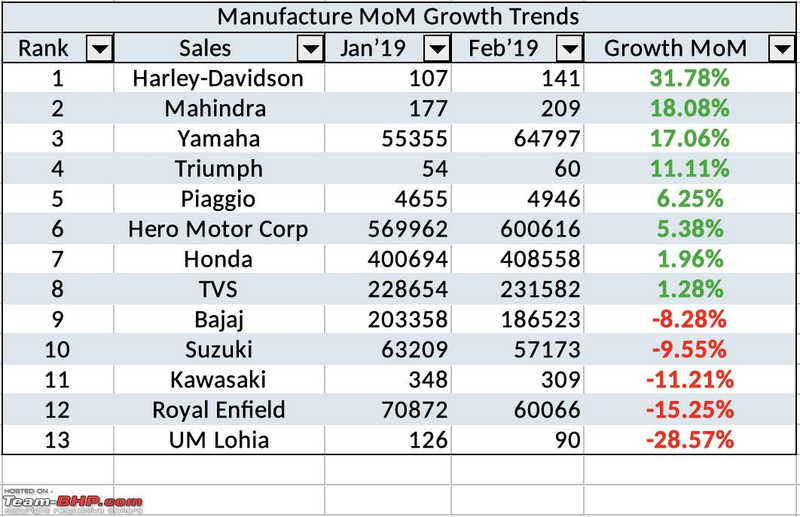 More than 50% growth YoY, although MoM sales have declined. 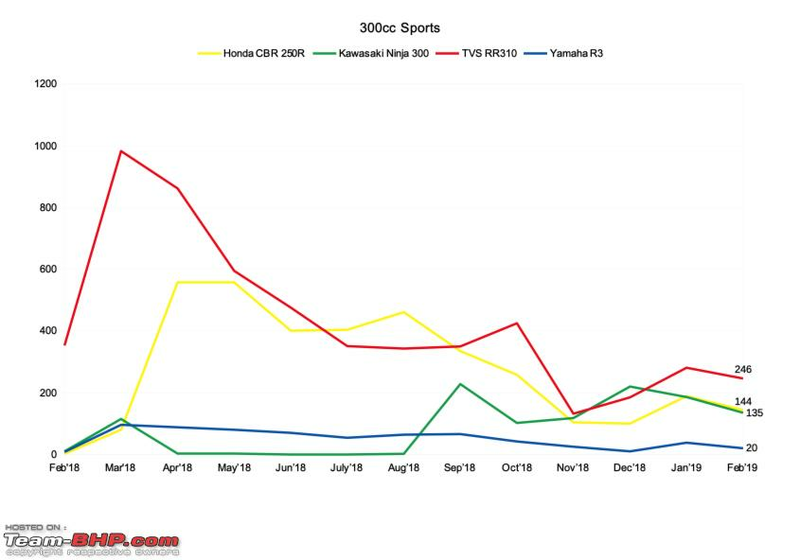 CKD Ninja 300 still does decent numbers. 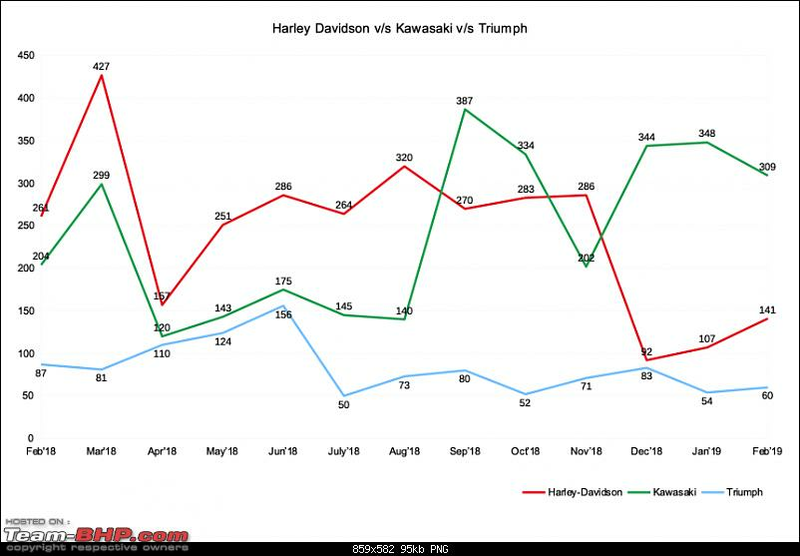 ZX6R off to a good start, although Ninja 1000 and Z900 bring the stable monthly numbers. Is in trouble. 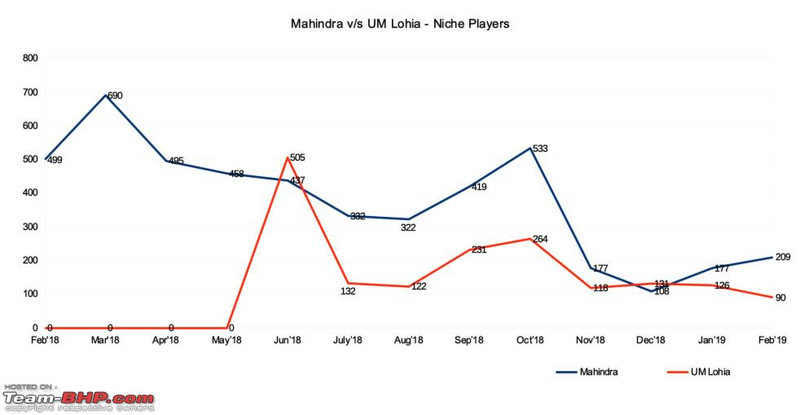 Third consecutive month where both their bread and butter models have negligible dispatches. 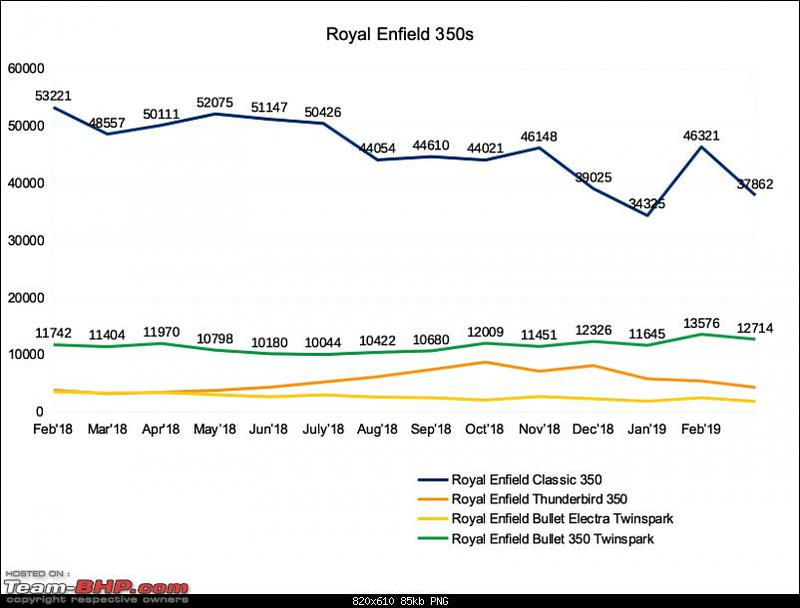 Royal Enfield 650 twins seem to have hit Harley Davidson the hardest? 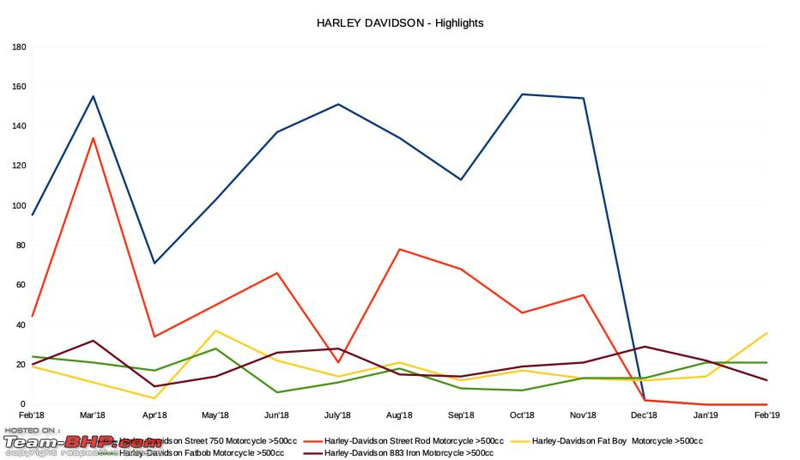 Stable numbers from their bigger motorcycles - Fatboy, Fatbob and Iron 883. 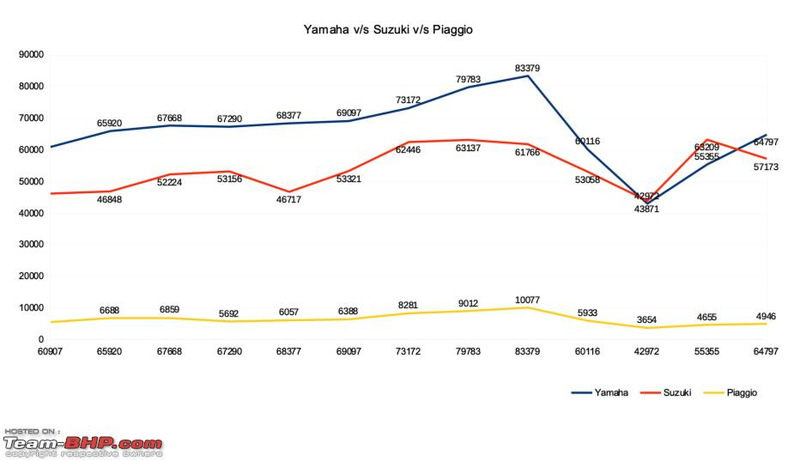 Is on a slow and steady decline, although no major hit seems to have happened due to the RE 650 twins. Company perhaps need to look harder at CKD assembly and price corrections? Last edited by CrAzY dRiVeR : 20th March 2019 at 23:36. 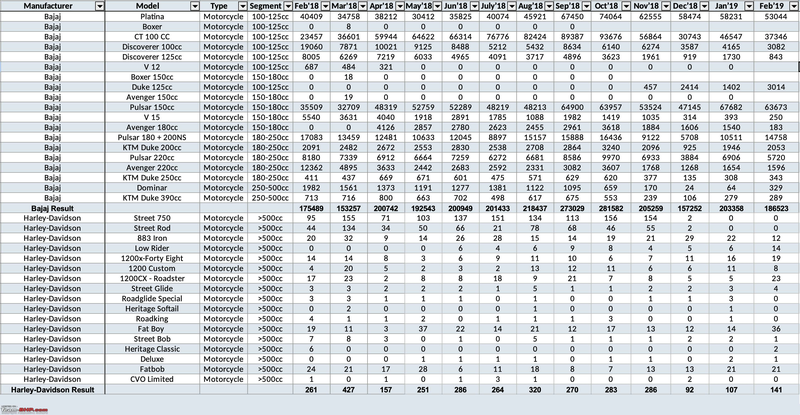 Thank you CD for once again painstakingly compiling the dispatch figures. 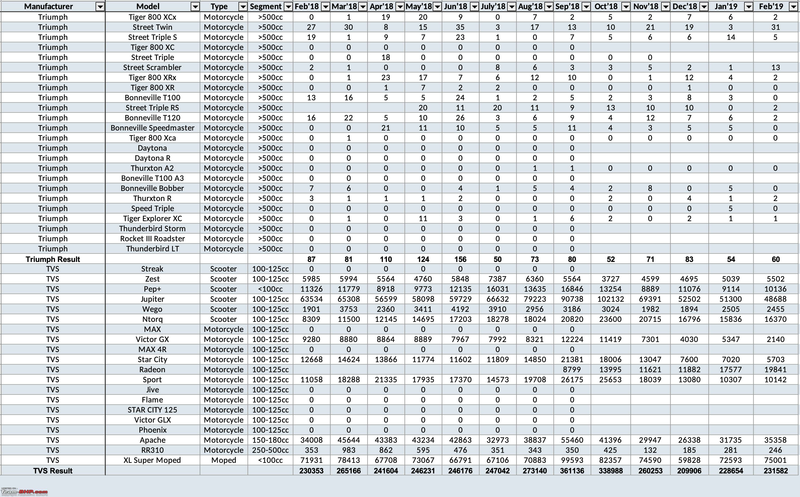 After months of breaking my head trying to prove some of the reported numbers were wrong, I'm throwing in the towel and just going ahead with the assumption that all the figures are correct. I have a couple of questions. 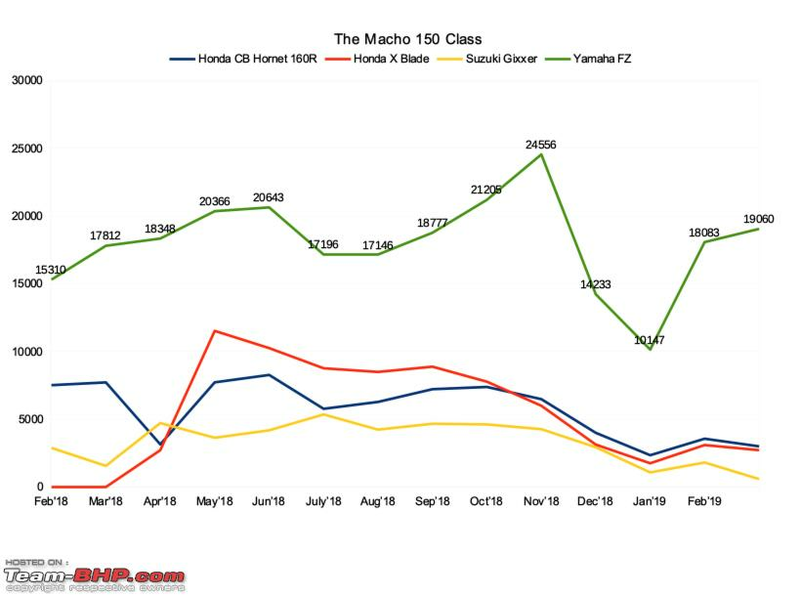 One, why is the chart with the Macho 150 Class missing the Pulsar 150? 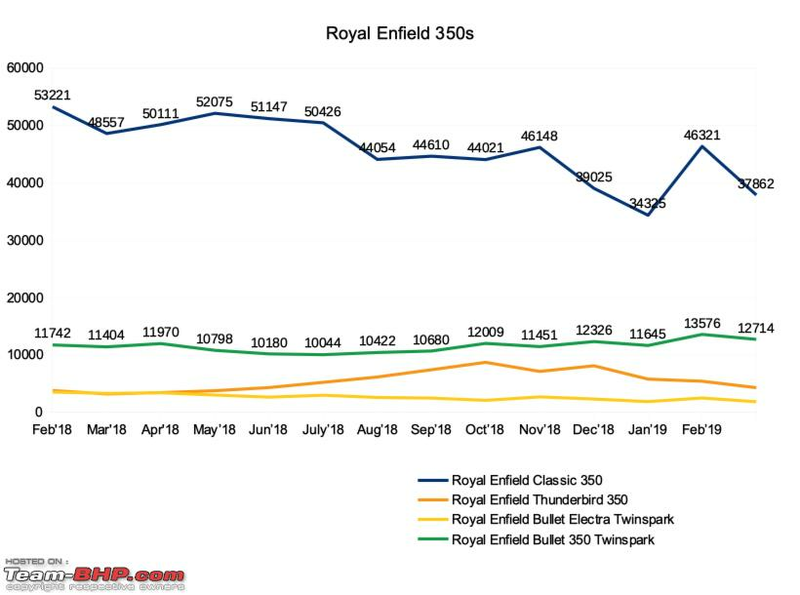 Also, given that the near 400 cc Dominar and Duke 390 are in it, dont the Royal Enfield 350s need to be in the 300cc naked class category? 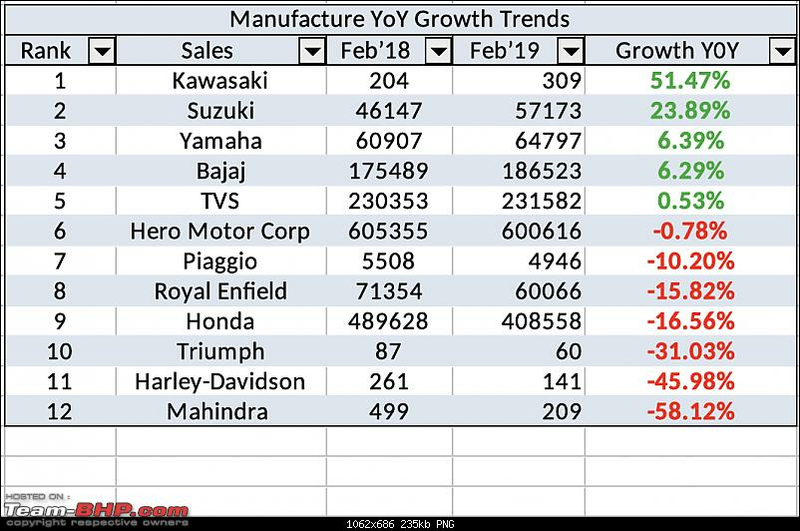 Considering the prevailing clouds that are hanging heavy over the automobile industry, I think the two wheeler market did better than many expected it to do. Sure a 1.1% MoM growth isnt great but its could have been a lot worse. 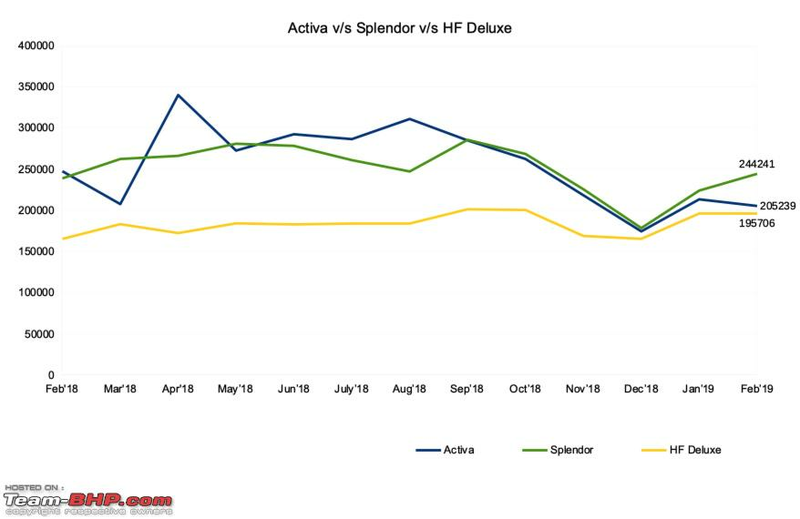 It will be interesting to see how manufacturers manage the inventory pileup and manufacturing and whether they will go in for dangerous discounts. 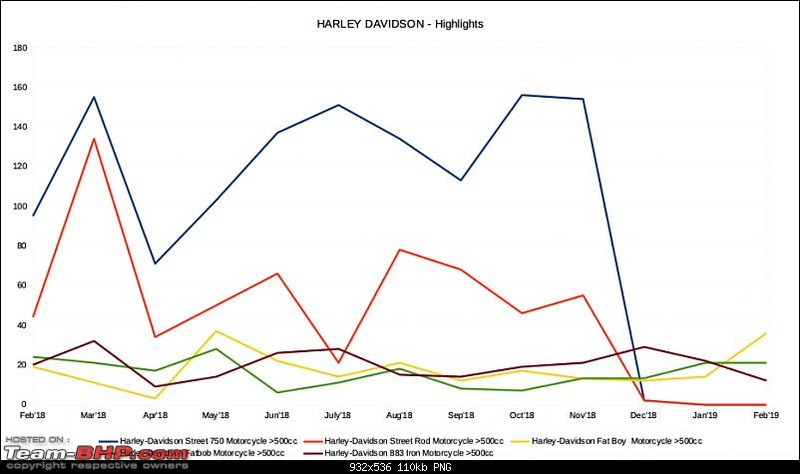 - Harley Davidson pulled off a rare double pair for the Street 750 and Street Rod (a cricketing reference that involves a batsman getting out without scoring in both innings of a test match). 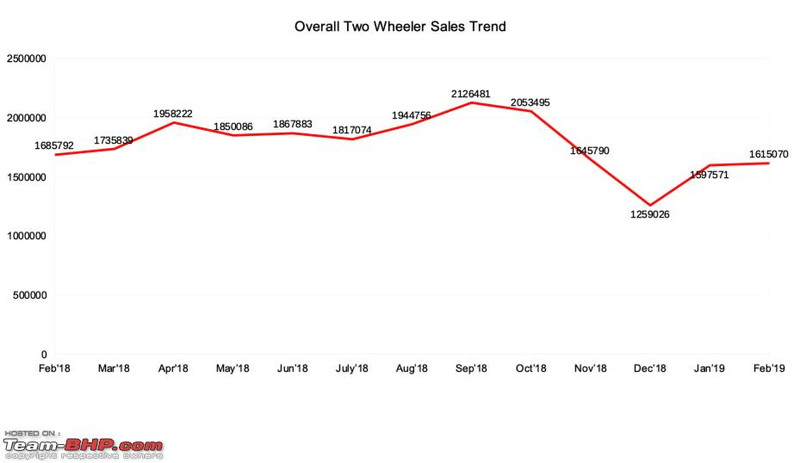 On the plus side, they managed to sell quite a few more of their expensive bikes. 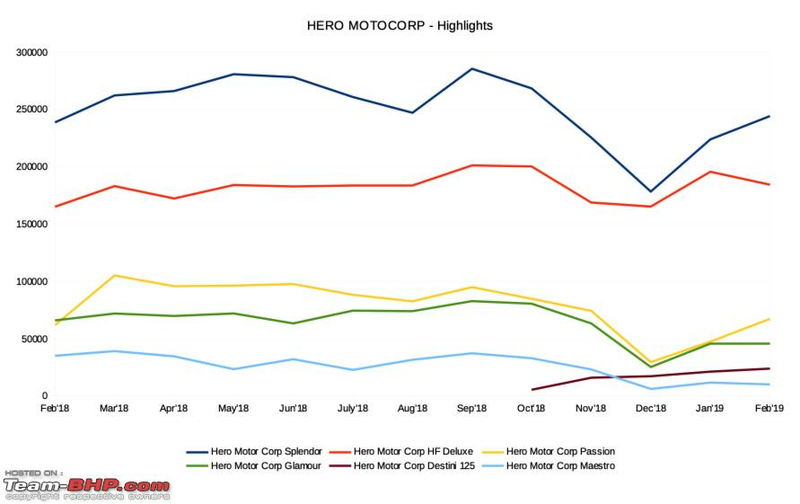 - Hero Motor Corp usually never gets my attention but the 200R must be called a flop by Hero's lofty standards. Hope this teaches them a lesson. 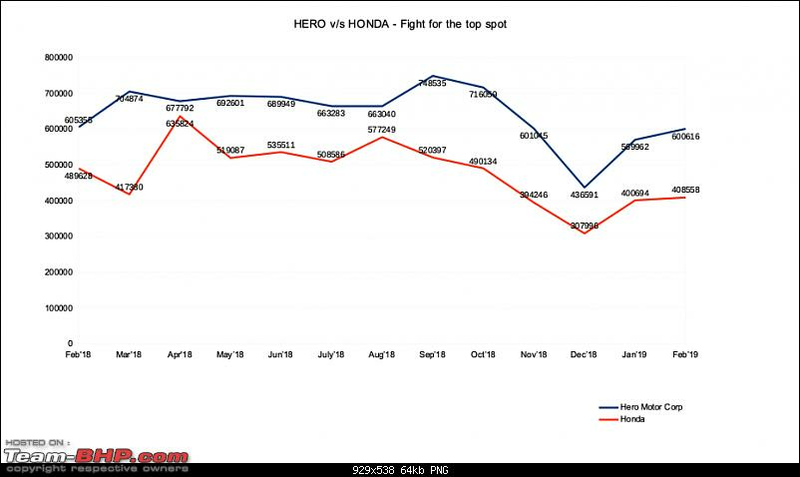 - Honda's Livo nearly doubled its sales MoM. Im a motorcycle guy and hand on my heart, I have never seen / noticed a Honda Livo. Have you? 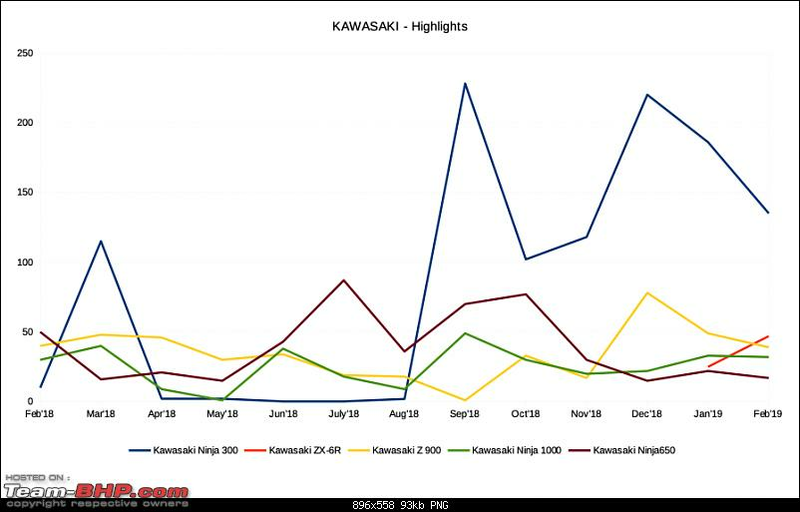 - Kawasaki had a worrying month because their fall in dispatches is masked by the arrival of the ZX6R. They lost 27% on their N300 in MoM dispatches. 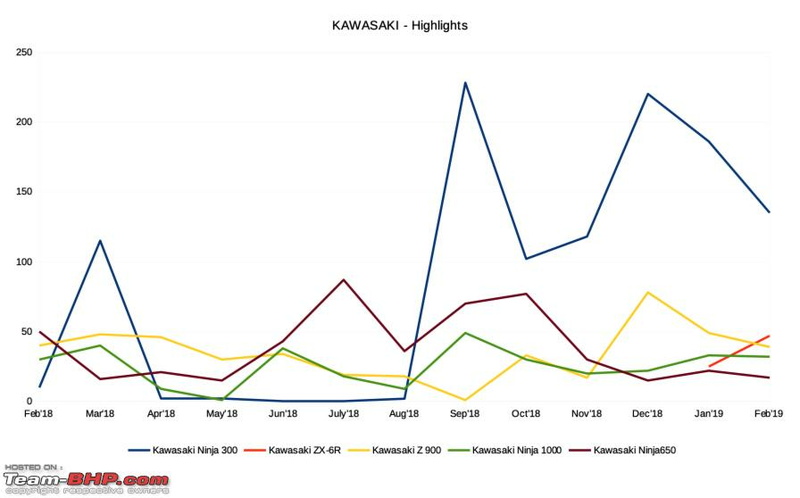 The company has pushed a lot of Z900s in the last few months, I dont know if that has been matched by corresponding sales. Signs point to inventory build up. 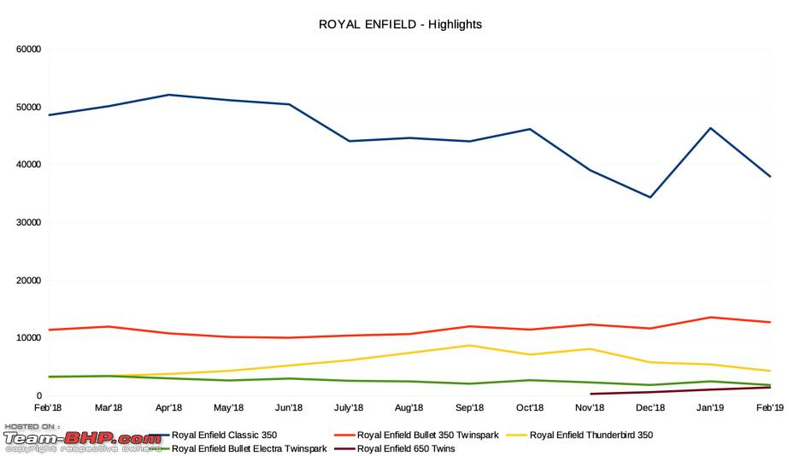 - Royal Enfield had a tough month as well. 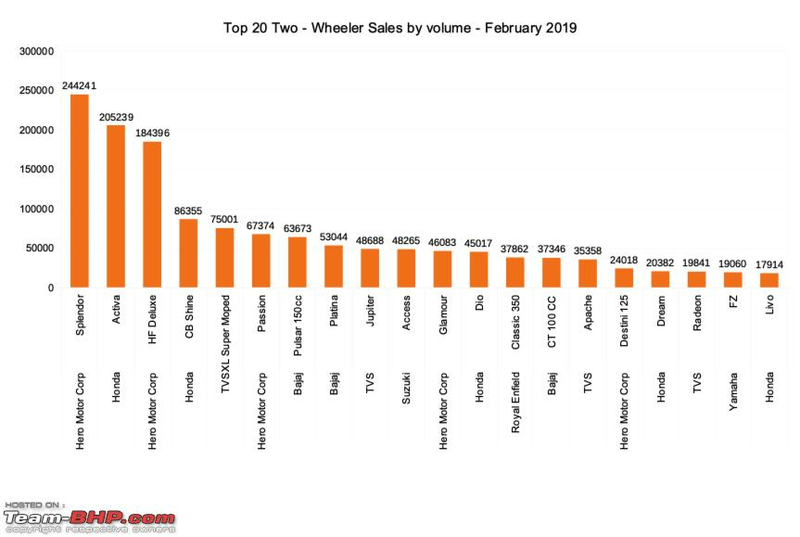 Though the 650s will bring in some volumes, there arent going to be a lot of profits associated with those bikes so the finance guys at RE must be frowning. Time for another round of special edition Classic 350s? I predict that if India wins the world cup we will get a special edition Classic 350 in the same colour as the cricket jersey with serialized numbers but owners will have to sign a disclaimer that they cannot take photos of their motorcycles near garbage dumps. Given RE's position, they might still go ahead and launch the said bike if India doesnt qualify into the next round of the world cup as well. 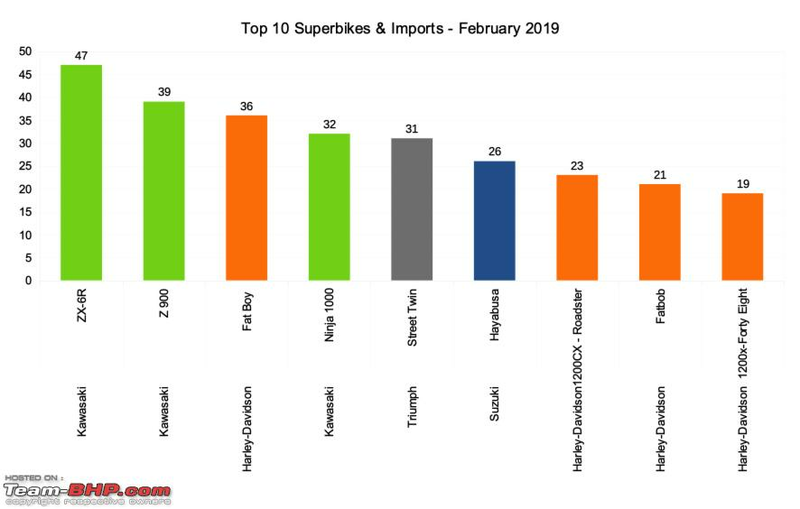 - Suzuki joined HD in the collecting the ignominious award of a double pair with the Intruder having no dispatches in Jan and Feb 2019. 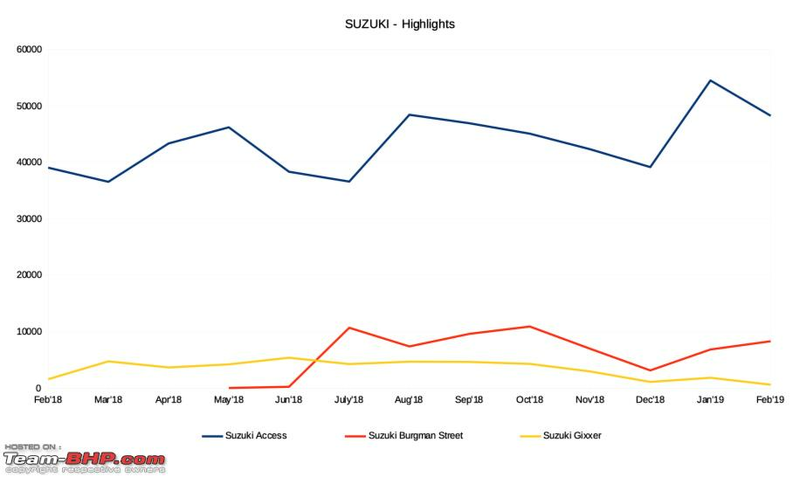 Back to the drawing board for Suzuki (no pun intended). 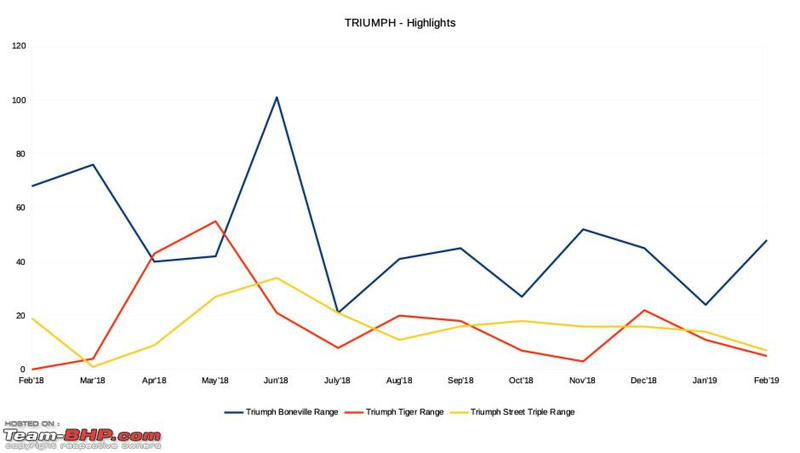 - Triumph had another middle of the road performance. 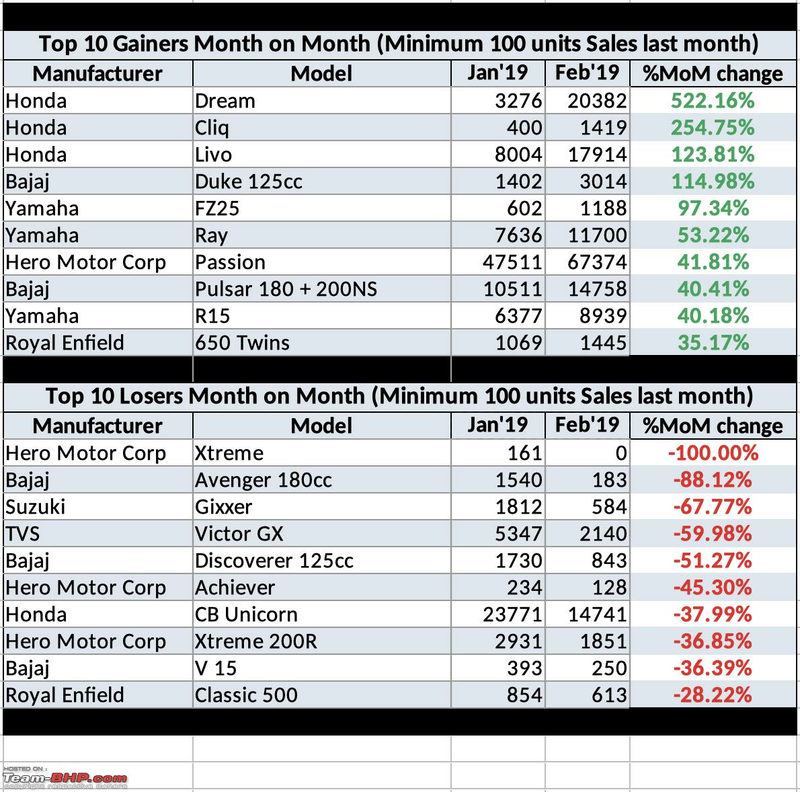 Though I said I will assume all the numbers are correct, I have to point out, the Speed Triple is not yet launched in India so the 5 units shown for Jan 2019 are wrong. 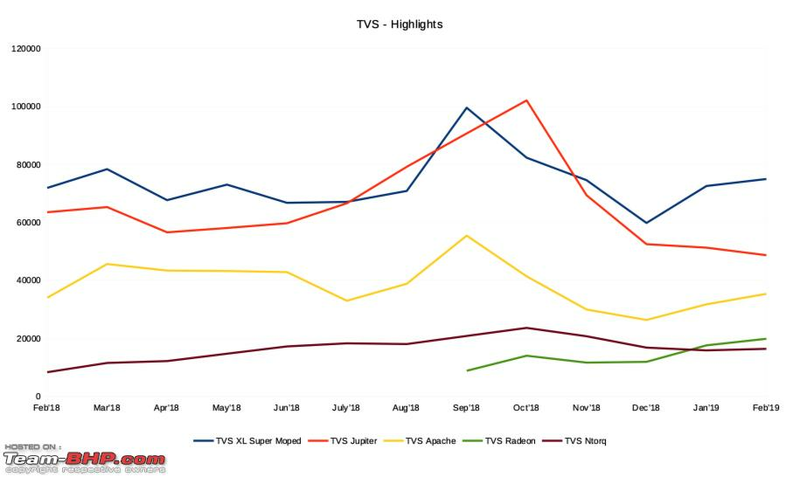 - TVS is seeing some of its stars like the err Star City and Victor GX fall from what they were doing a year ago. 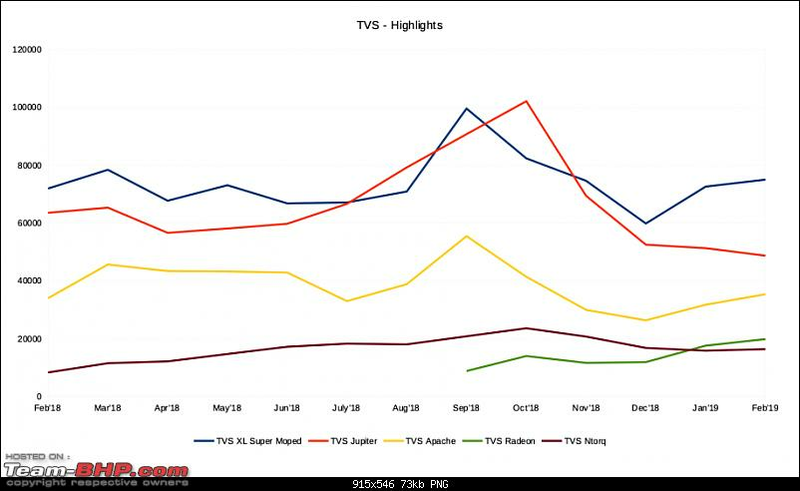 Im not sure if the Radeon is cannibalizing sales within TVS or if it is gnawing away at the competition. 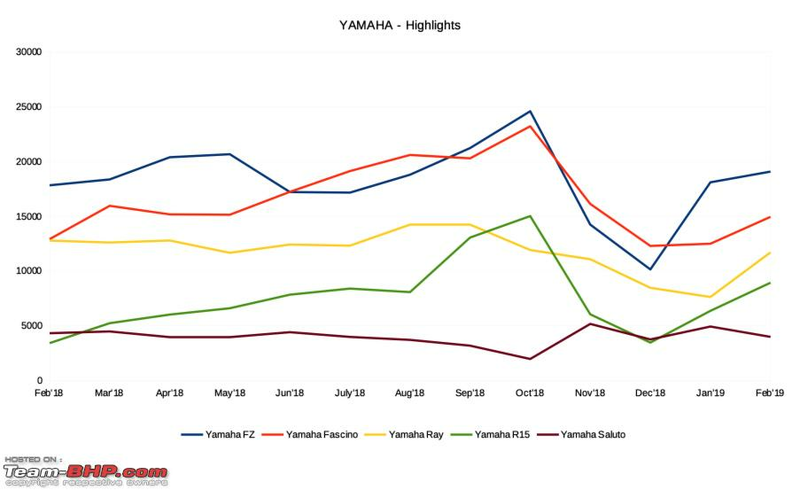 - Yamaha had a good month. I believe the addition of ABS to the R15 should help it get better sales numbers. 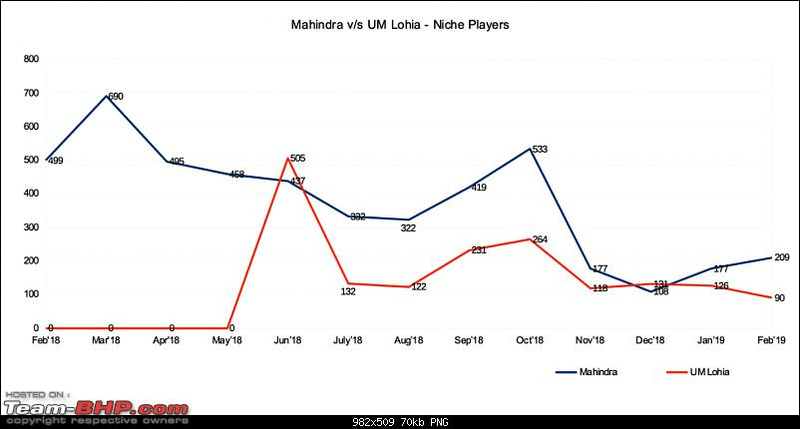 My prediction is 350 dispatches for the MT15 in next months report and below 100 units dispatched each month going forward. Anyone willing to bet on this? 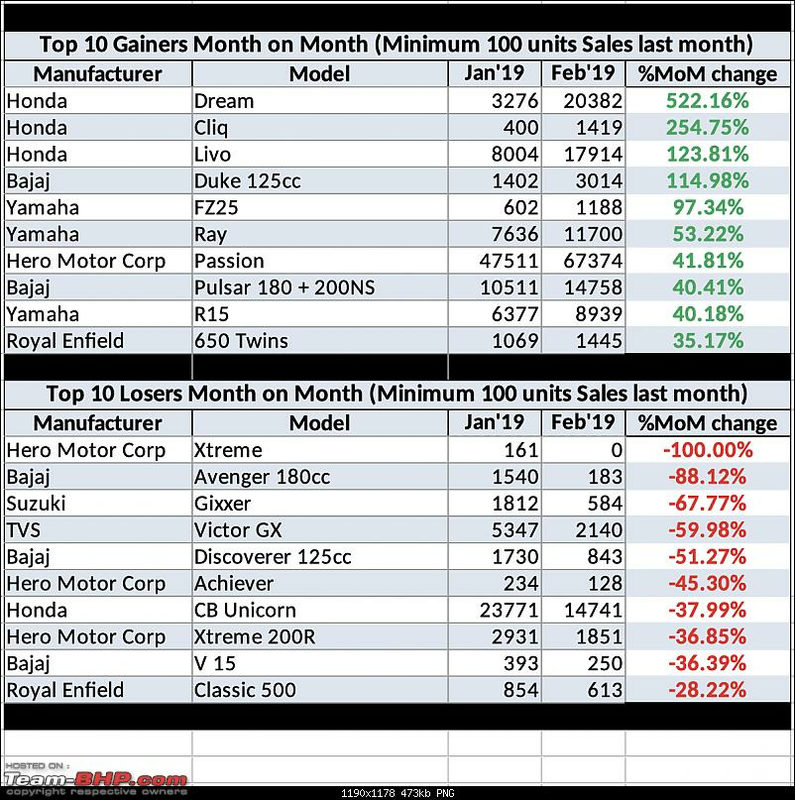 According to SIAM, February witnessed the seventh decline in eight months. 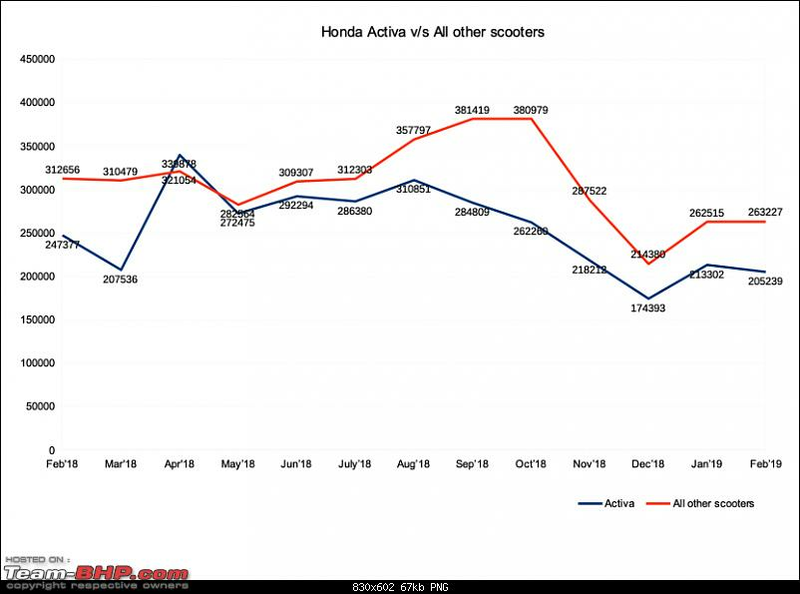 "With people postponing discretionary spends like buying cars ahead of the elections, coupled with the current subdued sentiments, it was unlikely that March sales will be high," said SIAM Director General Vishnu Mathur. 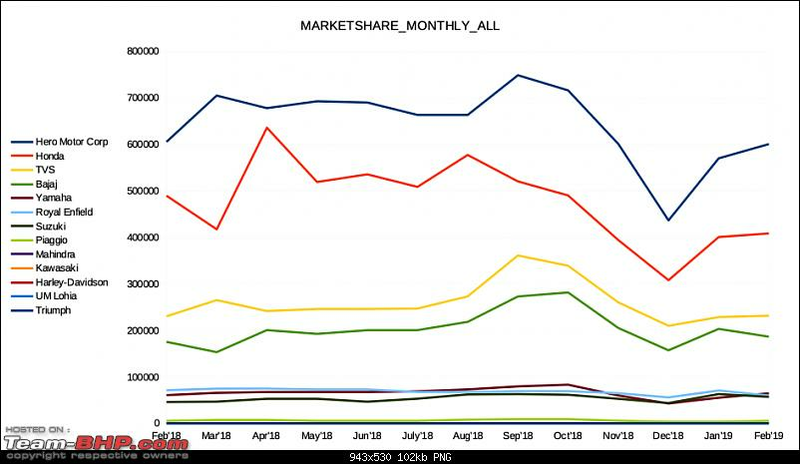 "So we are more or less looking to end the year at around 3% growth which we have witnessed so far." This is among the slowest growth rates witnessed in the last four years. 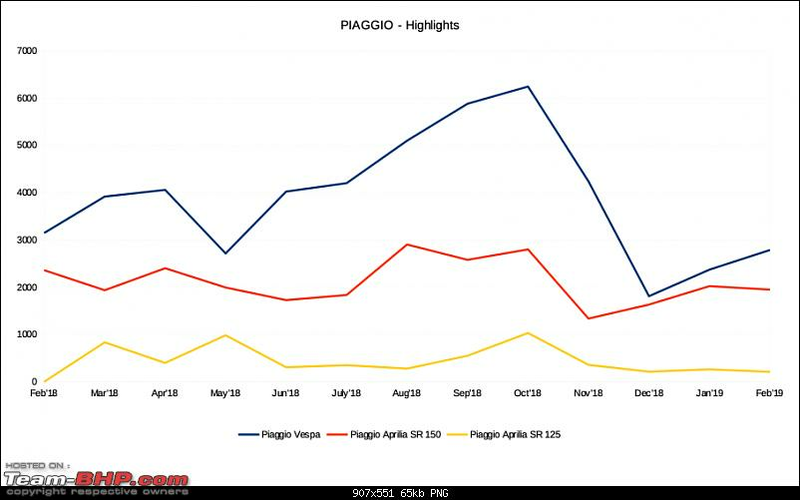 In the beginning of the fiscal, SIAM had projected 8-10% growth for PV sales but it was revised to around 6% after dip in sales from the third quarter onwards. 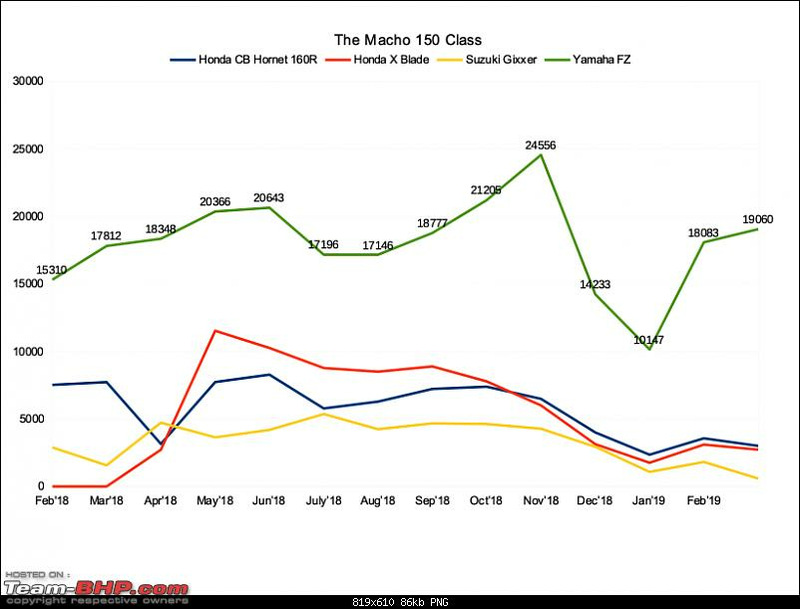 One, why is the chart with the Macho 150 Class missing the Pulsar 150? 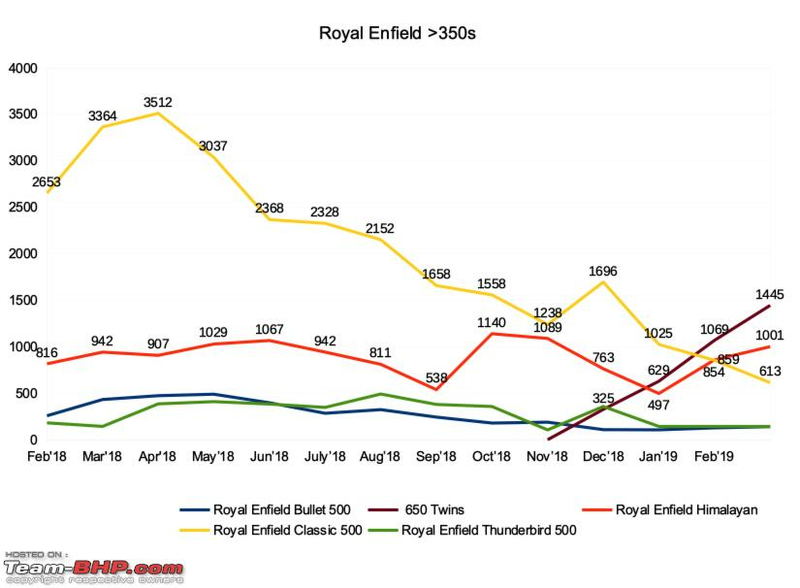 Also, given that the near 400 cc Dominar and Duke 390 are in it, dont the Royal Enfield 350s need to be in the 300cc naked class category? Thanks for the detailed post as always. 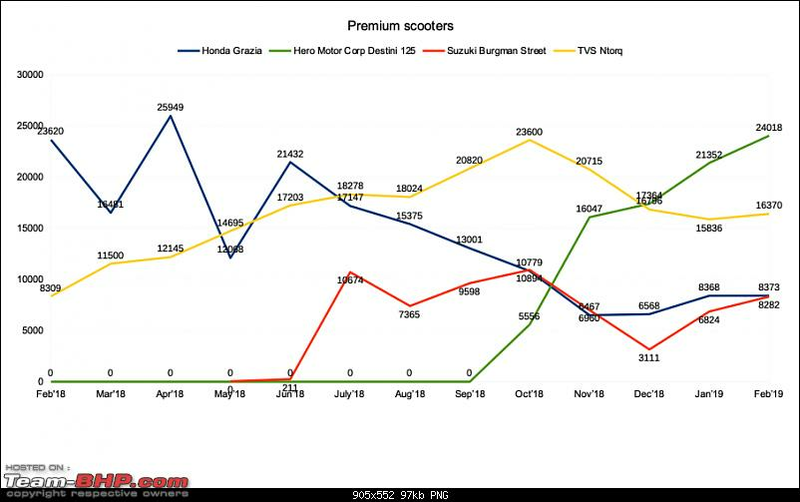 Pulsar and RE both had seperate graphs on their own, due to the different products involved. Dropped the Pulsar graph this time as I was trying to normalise the graphs for manufacturers instead. I doubt if clubbing RE with sports naked is a good idea - but it might happen as I'm thinking of trying the segment wise format next time, based on cc. 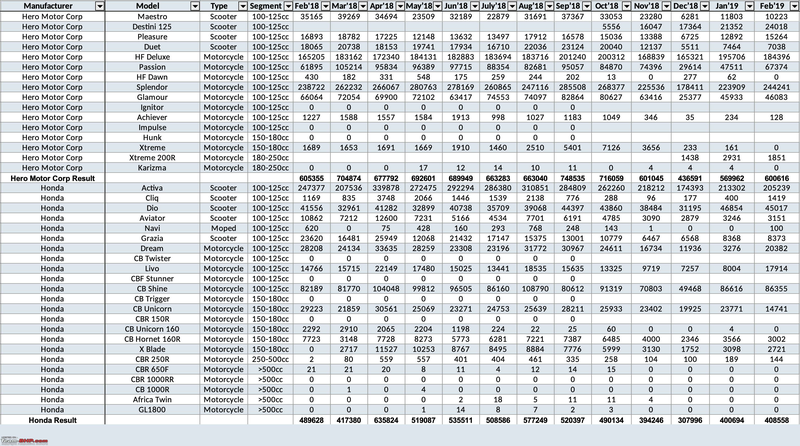 <100, 100 - 110, 110 - 125, 125 - 150, 150 - 180, 180 - 220, 220 - 250, 250 - 350, 350 - 500, 500 + sounds fine? 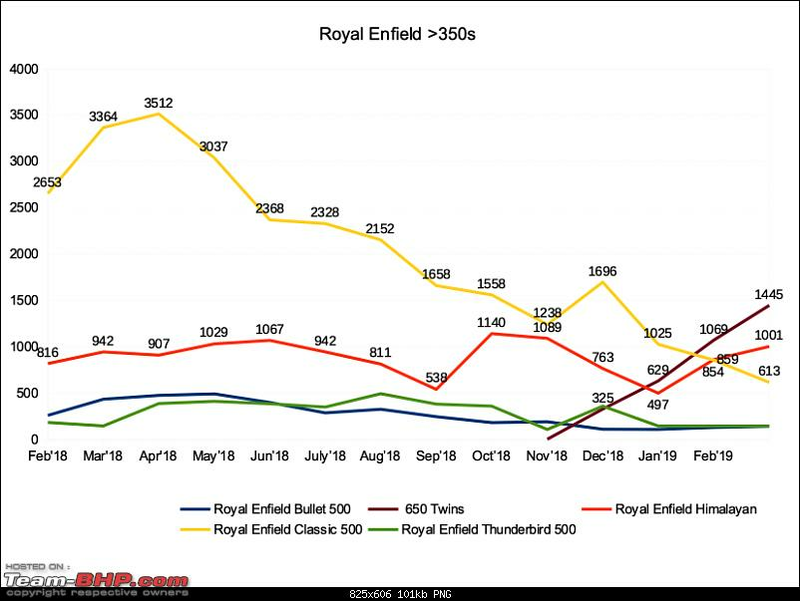 I shared this same line of thought for a while but then I heard multiple Royal Enfield (RE) owners complain that the new 650s are not RE enough. They apparently lack the much beloved character and feel of the old RE bikes. Im sure RE has head this feedback as well from customers who have been associated with their brand for decades. RE and Harley Davidson (HD) provide such a strange contrast in this matter. The biggest and hard to argue against, best motorcycle from the RE stable is considered the least RE of them all by purists. And in HD, the smallest and arguably best motorcycle in their stable (the Street 750) is considered the least HD of them all by purists. Strange are the times we live in. 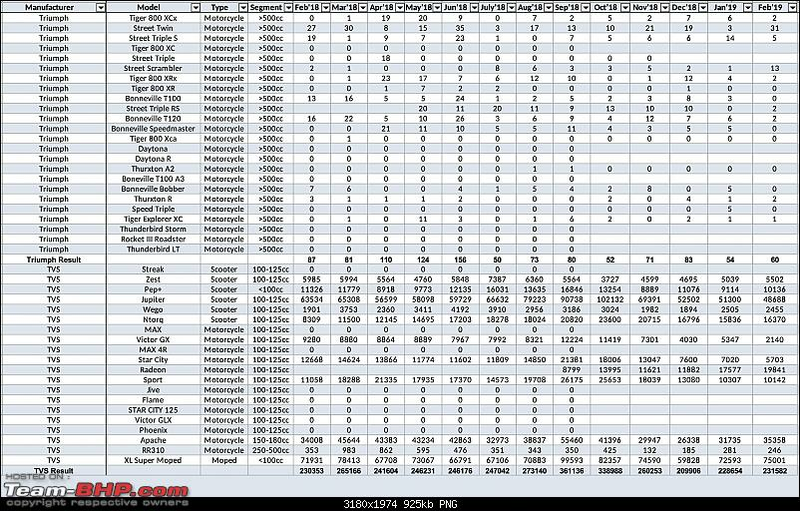 [list][*]Has the 125cc Duke gamble paid off? This is one move that Im watching closely. 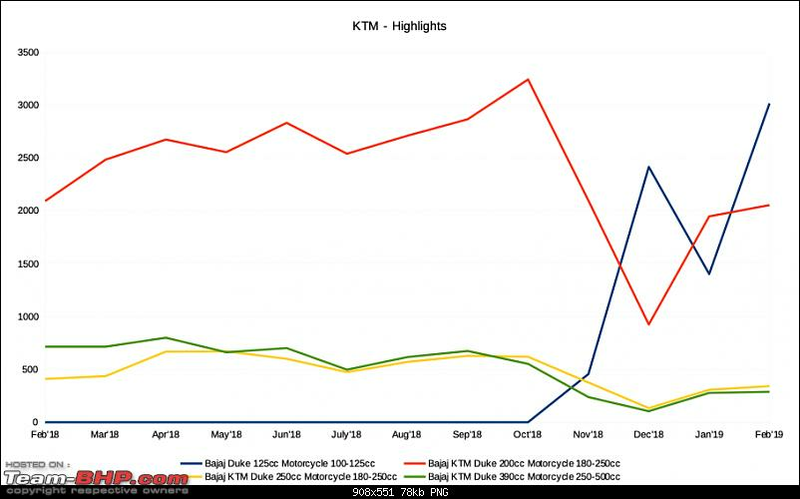 To my mind, it shouldnt cause it dilutes the Duke brand far too much without the payoff of great power that their bikes are known for. But it does drop the entry barrier for the Duke brand to much more affordable levels. 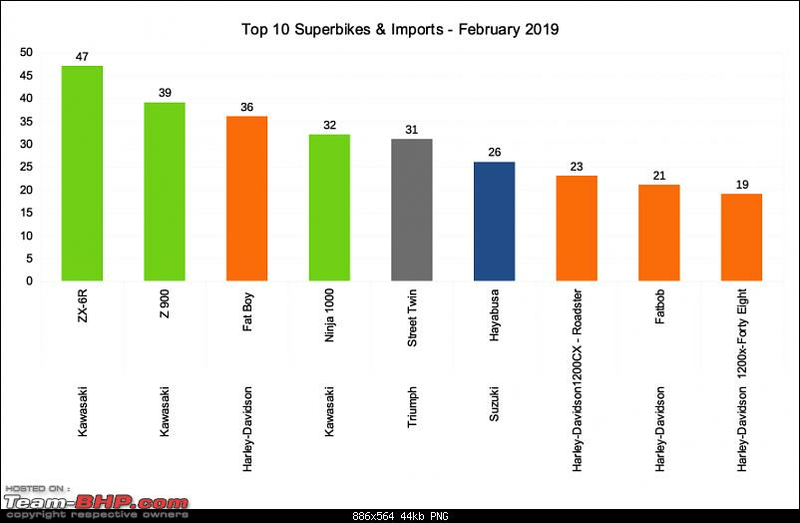 Assuming that these are mostly going to be ridden by by young riders (college going students, 1st jobbers etc), Im sure parents would be a lot happier with a 125 cc purchase rather than a 200, 250 or 390. I really doubt that the 650s are swaying the 500 buyers. 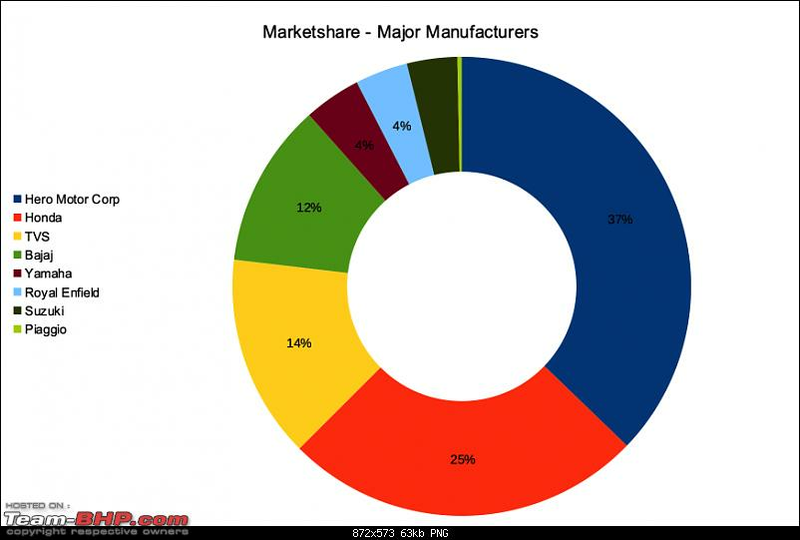 To me, there might be a small section who make the jump but the majority will definitely be from separate customer segments. 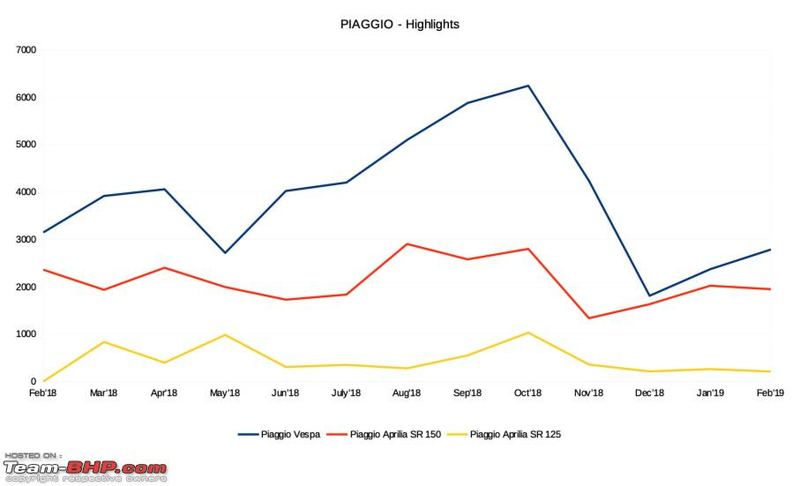 I believe the time for the 500s may slowly be coming to an end but if you look at it from RE's perspective, there were no development costs involved in the last year or two (except adding ABS) and the icing on the cake is that the margins on these must be phenomenal. As long as they can chug out a 1,000 or so units a month, their finance heads will be very happy. 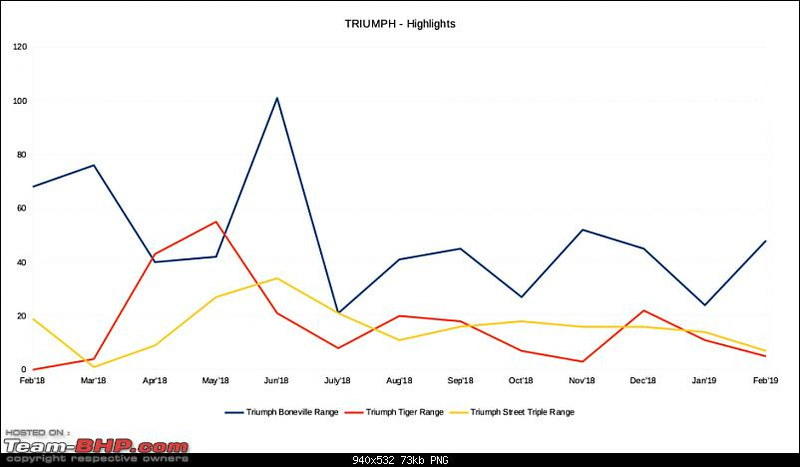 The biggest problem with Triumph today is that they have slowly priced themselves out of competition. When you go segment by segment, it becomes even more gloomy for them. 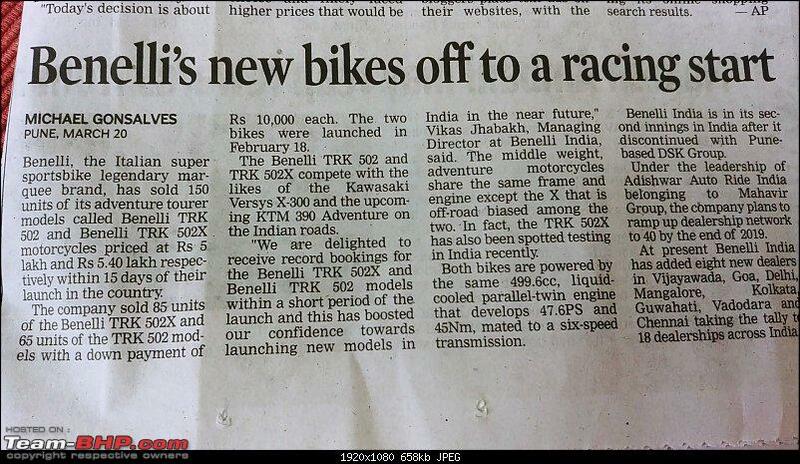 In the big nakeds, they dont have the Speed Triple in India (apparently doesnt make financial sense for them). The missing Daytona has conceded the Indian middle weight supersports market to the ZX6R. 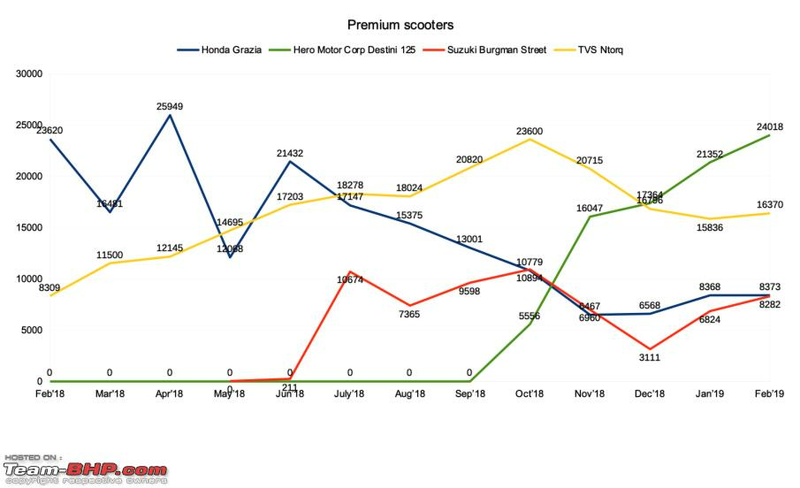 The Street Twins dont appear very appealing in the face of well built competition that's priced at a third of it. The Triple S is expensive and goes up against the Z900 and S750, both of which are excellent motorcycles as well. The Tiger is a very capable platform but I feel the willingness to downsize to the V Stroms and V650s and even the TRK502s of the world may pose a challenge to it. The Street Triple 765 RS is the lone warrior for Triumph, taking the charge to the lower priced and lower specced middle weights while also targetting the big boys with the top of the line toys that it has. The unfiltered segment wise format makes a lot more sense. Also if the dispatch numbers were put first and then the charts followed, it would be a lot easier to consume. Good question. Been thinking of it - And I can't even recollect what this motorcycle looks like! Had to go to their website to confirm. Where are they selling all these bikes? I really doubt that the 650s are swaying the 500 buyers. But the 500s have lost their image! 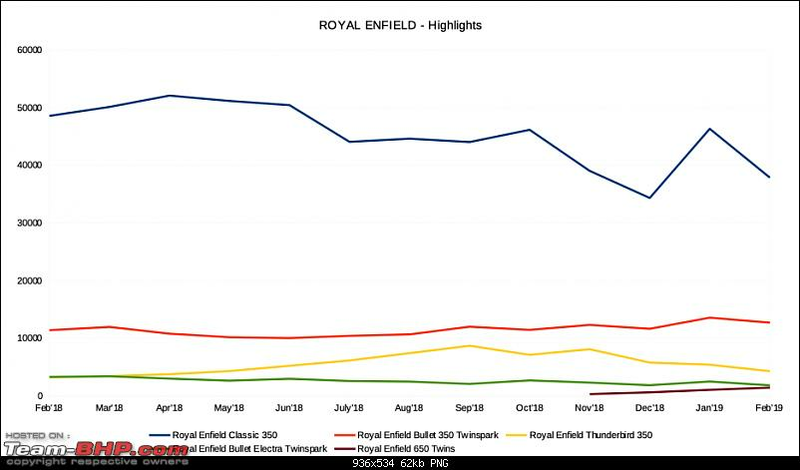 350 was the Enfield for everyone, and 500 was for the man who sought to be a level above them! No longer is the case with the 650 twins around! The Tiger is a very capable platform but I feel the willingness to downsize to the V Stroms and V650s and even the TRK502s of the world may pose a challenge to it. I was just browsing through the newspaper and spotted this bit of good news. Benelli sold 85 units of the TRK 502X and 65 units of the TRK 502. That's very impressive indeed. I had a feeling that the TRK twins would bring in some success for Benelli but Ive been met with skepticism so far. Im not sure if the 500s lost their image, they still are the same bikes they used to be. Had RE made the 650s more ummm Royal Enfield-ish and characterful, I would have fully agreed that the 500s would have been replaced by the 650s. [*]Is in trouble. 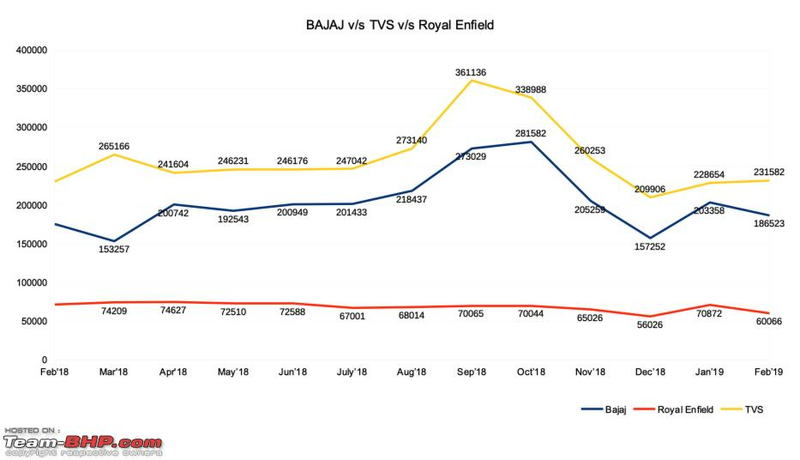 Third consecutive month where both their bread and butter models have negligible dispatches. 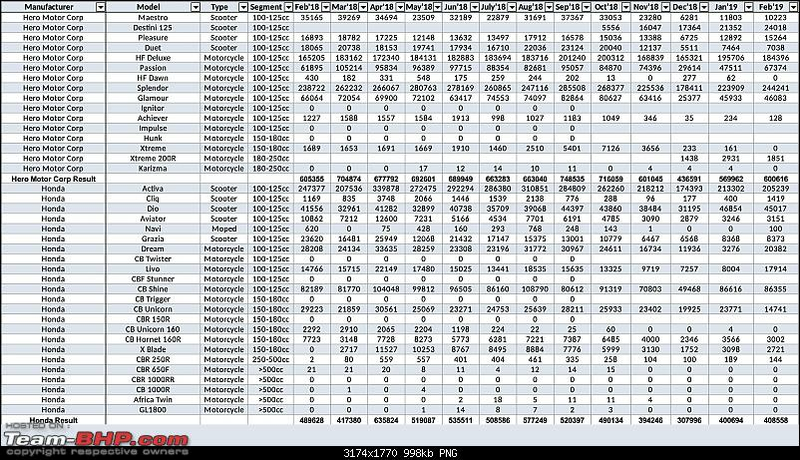 [*]Royal Enfield 650 twins seem to have hit Harley Davidson the hardest? 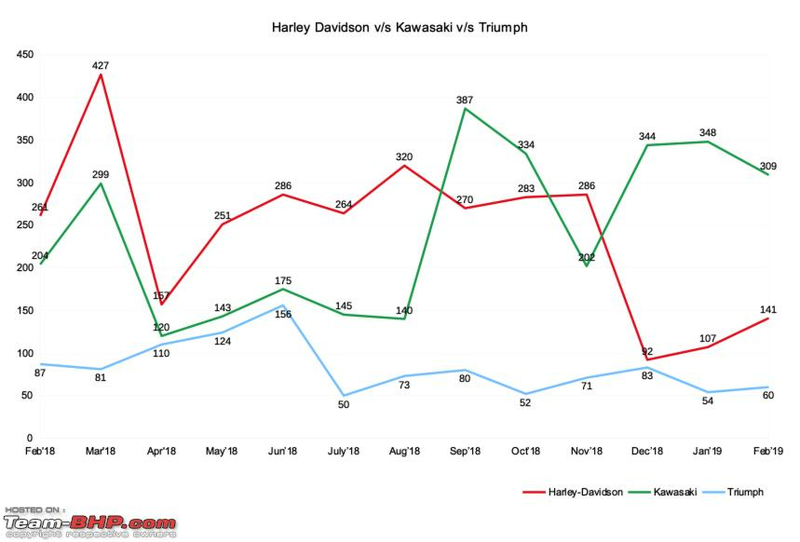 I'm not sure Harley has begun selling the 750 twins again after the brake recall. If I'm correct they are still awaiting the parts for the fix.